Deepika Padukone and Ranveer Singh recently hosted their third and final wedding reception in Mumbai. The mega bash was attended by who’s who of Bollywood. Among the guests were Shah Rukh Khan, Saif Ali Khan, Kareena Kapoor Khan, Sara Ali Khan, Karan Johar, Arjun Kapoor, Malaika Arora, Amitabh Bachchan, Aishwarya Rai Bachchan, Janhvi Kapoor, Hrithik Roshan, Shilpa Shetty and Sonakshi Sinha. 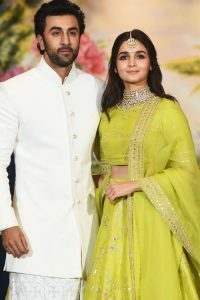 And while the whole of B-town was present at the event, lovebirds Ranbir Kapoor and Alia Bhatt were conspicuous by their absence. Wondering why Ranbir and Alia, who are very close to DeepVeer, gave their wedding reception a miss? Well, if a report on Bollywood Hungama is to be believed, the duo was shooting for their upcoming film Brahmastra over a strenuous 20-hour schedule. One can understand that by the end of it, the two must have been too exhausted to attend Deepika and Ranveer’s wedding reception. At the reception, Deepika and Ranveer looked absolutely stunning together. Their looks became a hot topic of discussion and deservingly so. Big B danced to some of the hit dance tracks of Ranveer whereas Shah Rukh and Malaika recreated their iconic Chaiyya Chaiyya even as Ranveer cheered them on. After almost three weeks of celebration, Ranveer is back to work. He attended the trailer launch event of his next release Simmba with producer Karan Johar, director Rohit Shetty and co-star Sara Ali Khan. The film, bankrolled by Dharma Productions and Rohit Shetty Picturez, is slated to hit the screens on December 28.